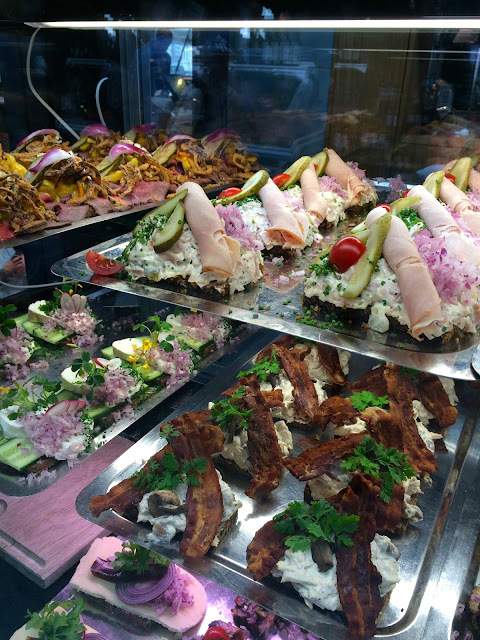 After visiting Copenhagen, I became fixated on smørrebrød. The open faced sandwiches feature all kinds of toppings and spreads atop thin slices of bread. Walking through the Copenhagen markets, I was in awe of the tiny works of Danish food art. The simplest versions have two ingredients -rye bread and a thin layer of mayonnaise. The more creative versions feature such combinations as smoked salmon and cucumber, fish cakes and dill mayonnaise, or thinly sliced meat and horseradish cream atop various kinds of bread. The layering of different colors and textures creates a snack that is both aesthetically pleasing as it is delicious. When I arrived back in Pomfret, I ventured into my herb garden and local farmstand for inspiration. 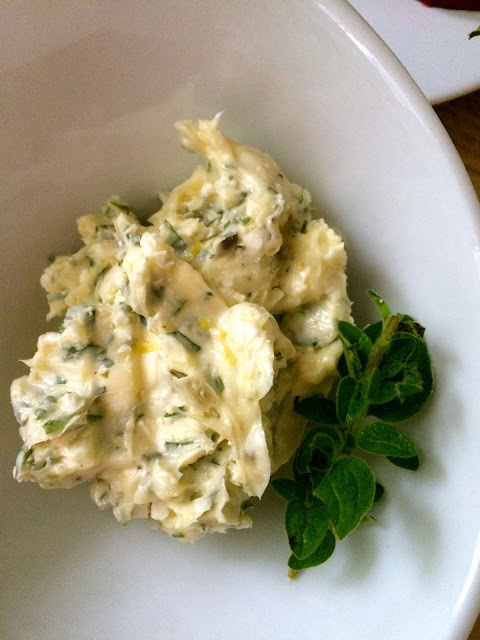 My pots were overflowing with mint, basil and parsley so I whipped them into an herb compound butter with a Greek twist. 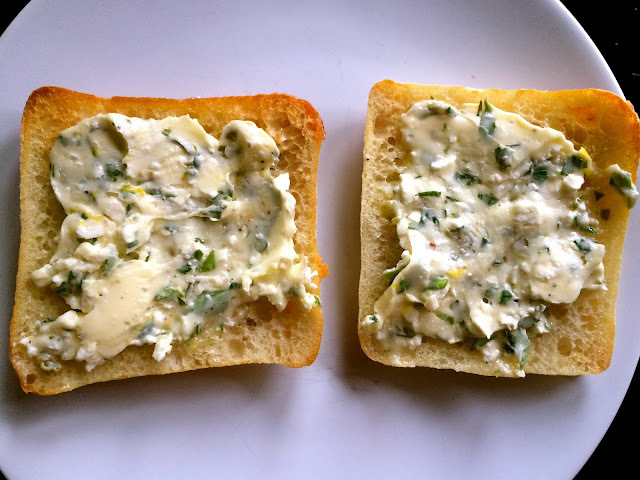 The buttery spread had a tang from chopped capers and an added salty creaminess from crumbled feta. For toppings, I drove down to Lapsley Orchard in Pomfret Center and found overflowing barrels of gleaming multicolored heirloom tomatoes. I knew they would be the stars sliced atop ciabatta with a slathering of my compound butter and a sprinkling of Fleur de sel (a purchase from Paris). I practically ran home in anticipation to begin slicing my snack. With a wooden spoon, mix the butter, 1 t lemon zest, capers, and herbs in a small bowl until fully incorporated. Fold in the crumbled feta cheese and season with salt and pepper. Set aside at room temperature until ready to spread. To assemble the sandwiches, toast each slice of ciabatta and spread a generous layer of the Feta Herb Butter across each surface. 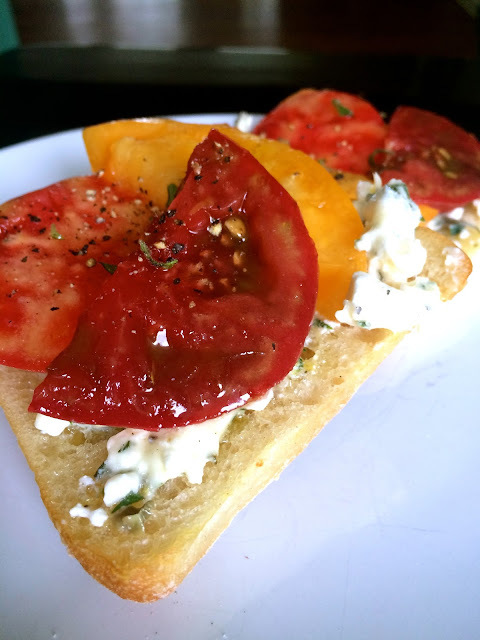 Next arrange a couple slices of tomatoes on each piece and sprinkle with Fleur de sel, more black pepper, and additional lemon zest. The ultimate salty snack! If you do not use all the compound butter, it's wonderful atop baked fish or poultry or stirred into fresh pasta.